It's a relaunch of Igora Royal! True Color In High Definition. Developed with colorists, for colorists, Igora Royal stands for true color: True Performance, True Inspiration and True Partnership. It empowers you to create by providing true-to-swatch results, amplified intensity and maximum coverage. Igora Royal delivers 100% Reliability for Unique Looks - even under challenging conditions. This is the core line for all natural & fashion color worlds. Choose from over 90 shades. 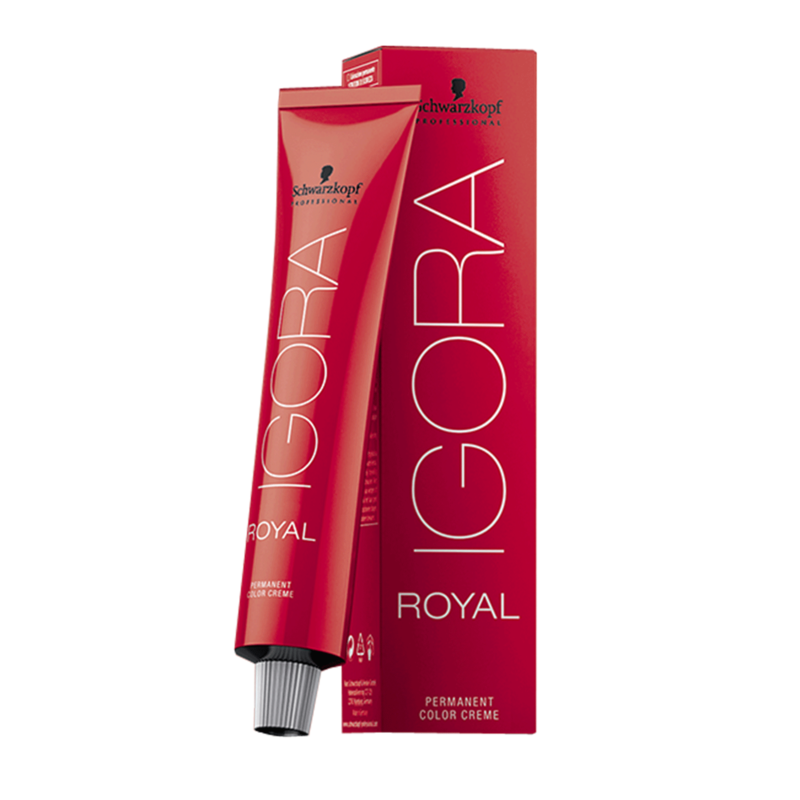 Igora Royal Absolutes for outstanding coverage and vibrancy on mature hair. Choose from 15 shades. Igora Royal Fashion Lights for intense fashion highlights (Lift & Tone). Choose from 6 shades. Usage of shades with up to 100% white hair coverage: Use Igora Royal 3%, 6%, 9% or 12% Developer. Mixing ratio 1:1 Apply on dry hair. Allow to develop for 30 - 45 minutes. Rinse well. Shampoo and neutralize with BC Bonacure Color Save products. Use 3% Color & Care Developer when coloring darker. Use 6% Color & Care Developer for tone-on-tone, 1 tone lighter or coverage. Use 9% Color & Care Developer for coloring 1-2 tones lighter. Use 12% Color & Care Developer for coloring 2-3 tones lighter. For worn out color on previously tinted hair please proceed a dual application; the colorist method for previously colored hair. Additional heat is optional and reduces the developing time by a third. Usage of shades with up to 50% white hair coverage: Use 3%, 6%, 9% or 12% developer. Mixing ratio 1:1. Apply on dry hair. Allow to develop for 30 - 45 minutes. Rinse well. Shampoo and neutralize with BC Bonacure Color Save products. Use 3% Color & Care Developer when coloring darker. Use 6% Color & Care Developer for tone-on-tone, coloring 1 tone lighter or for coverage. Use 9% Color & Care Developer for coloring 1-2 tones lighter. Use 12% Color & Care Developer for coloring 2-3 tones lighter. If a shade with 50% coverage has been chosen as the target shade, for hair that is 2 or more levels lighter a corresponding base tone (-0, -4) needs to be added using a mixing ratio 2:1 (40g 4-99 + 20g 4-0). For worn out color on previously tinted hair, please proceed with a dual application; the colorist method for previously colored hair. Additional heat is optional and reduces the developing time by a third. Aqua (Water), Cetearyl Alcohol, Ceteareth-20 Ammonium Hydroxide Toluene-2,5-Diamine Sulfate, Glycol Distearate Octyldodecanol, Glyceryl Stearate, Sodium Laureth Sulfate, Glycerin, Resorcinol Potassium Hydroxide, Sodium Cetearyl Sulfate, 2,4-Diaminophenoxyethanol HCL 4-Chlororesorcinol, Oleic Acid, Sodium Sulfite, Parfum(Fragrance), Toluene-2,5-Diamine, Silica, Tetrasodium EDTA, Carbomer, Potassium Stearate, m-Aminophenol, Polyquaternium-39, Ascorbic Acid, Sodium Sulfate, Linoleamidopropyl PG-Dimonium Chloride Phosphate, Benzyl Salicylate, Moringa Pterygosperma Seed Extract, Citric Acid, Titanium Dioxide. The Igora Royal High Definition Technology features high-definition pigment matrices for clearest tone direction, enhanced true-to-swatch results, amplified intensity and maximum coverage. "Amazing rich color. Long lasting color. Covers gray."